Happy End Of Your Summer And Welcome To Our Coastal Blog! 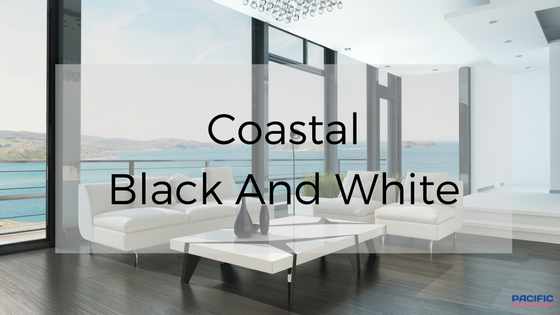 The Colors, Black And White In Coastal Living May Not Seem Like Tradtional Coastal Colors. Generally Those Are Blues And Whites, But Let's Take A Look At Different Designs For Black And White. 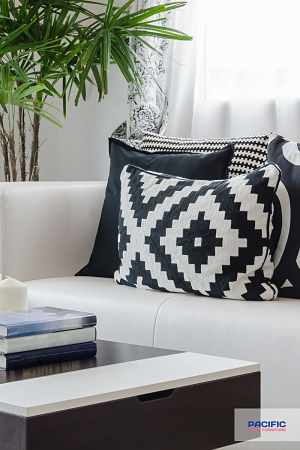 Pillows Always Make A Statement On The Sofa! Mix Up The Patterns. 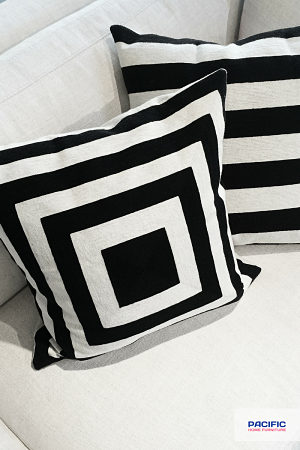 Keeping The Colors Classic, As in Our Black And White Theme, Makes Balancing The Patterns Easy. Design Tip. Watch Your Pattern Scale, As In The Image Above. Add A Solid Colored Pillow While Adding A Medium Pattern And Smaller Pattern Give The Right Balance. None Of The Patterns Over Whelm One Another. 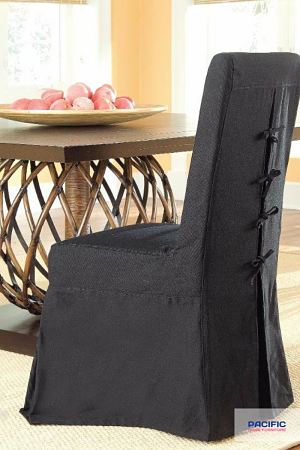 Pacific Beach Dining Chair. Found At Pacific Home Furniture. Black And White Accent Chair With A Striped Throw. Source. 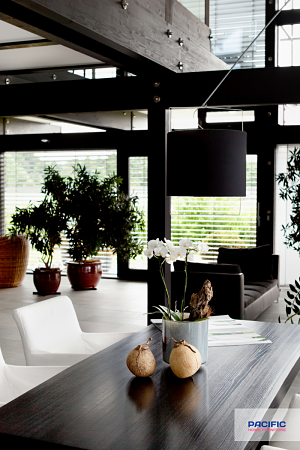 Black And White In A Coastal Entry. 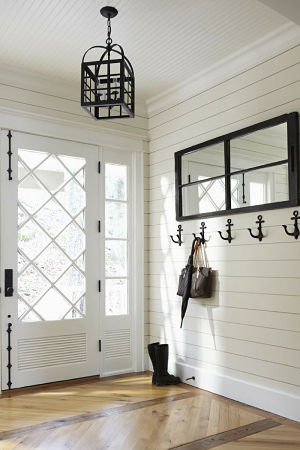 The Anchor Hooks Add A Nautical Feel. The Black Wood Grain Table Is Elegant Yet Simple. The White Chairs Are A Welcome Addition. Clean And Fresh. Pacific Home Furniture Offers Beautiful Decor For The Coastal or Traditional Styled Home! 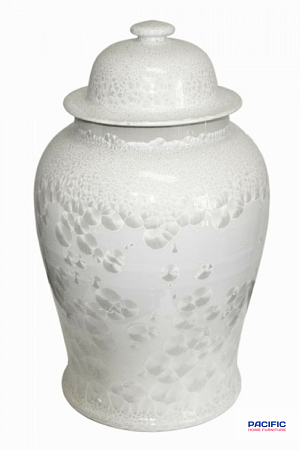 The Beautiful Piece Displayed Above, The Crystal Shell Temple Jar Can Be Found At Pacific Home Furniture. This Piece Is One Of Our Best Sellers! Two Will Look Beautiful In The Entryway! 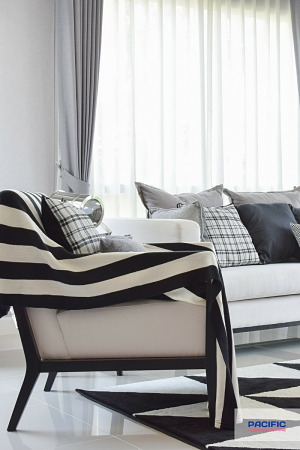 Using Black And White Can Easily Fit In A Coastal Home. Has Black And White Become A New Favorite For You? Thank You For Taking Time To Read Our Coastal Blog. We Are Always Happy To Hear From You With Comments, Concerns Or Questions. Reach Us Here On The Blog Or At contactus@pacifichomefurniture.com. We Are Looking Forward To Hearing From You! See What We Are Doing On Pinterest. We Have A Coastal Black And White Board To Inspire You Further With A Black And White Style! DISCLAIMER: The Beautiful Images You Are Enjoying Do Not Belong To Pacific Home Furniture Unless You See Our Logo.